First time posting on this side, but can a member clarify what Brady's TRUE rookie card is please and what would it cost me to obtain one? The 2000 SP is his best rookie card and usually runs about $1,200 for an 8 and about $1,750 for a 9. However, it is not a very attractive card. I personally prefer the 2000 Bowman Chrome or Bowman Chrome refractor. The regular Bowman Chrome is about $90 in a PSA 8 and $150 in a PSA 9. The refractor is probably about $600 in a PSA 8 and $850 in a PSA 9. If you don't care for Chrome cards, you could go with the 2000 Bowman regular issue at about $50 in a PSA 8 and $85 in a PSA 9. These are Brady's best RC's. Like I said, the best RC is the SP but I prefer the "looks" of the Bowman/Bowman Chrome more. You can have a better looking card and save some dough in the process. Last edited by S_GERACE; 09-06-2015 at 05:18 PM. 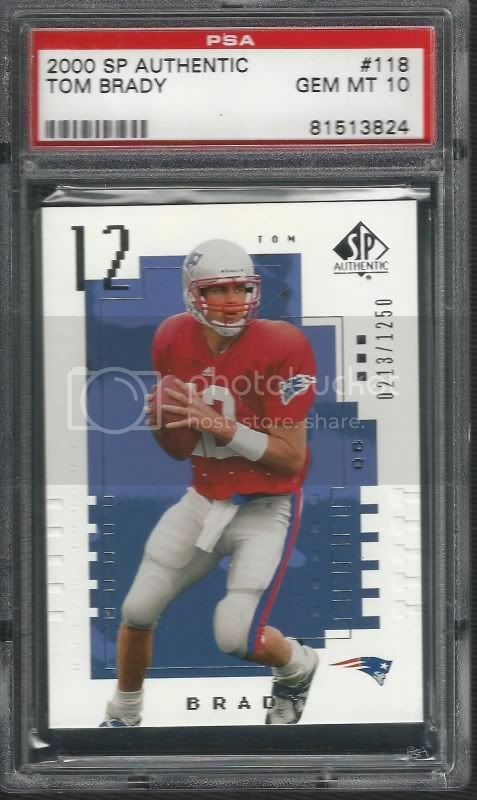 Here is a scan of the 2000 Bowman Brady. Thanks all, wouldn't mind going for an SP from UD but the ones on eBay are crazy priced. Anyone know where I can buy one "reasonable"?? Isn't the Auto Playoff Contenders a very popular one as well. Maybe not classified as a true rookie because of the auto and I guess it was an insert-type card, correct? I personally wouldn't include it because of the auto/insert aspect but yes, it is a popular card. It's all a matter of personal preference. The Bowman Chrome refractor is also an insert card but to me it it's not a chase card like the Playoff Contender. To give you an example using vintage cards, Otto Graham's RC is listed as the 1950 Bowman on the PSA registry but if someone were to approach me with a 1946 Sears card I wouldn't dismiss them if they called it his rookie card. The argument against the 1950 Bowman is that there was actually another card issued prior to it. The argument against the 1946 Sears is that it was not nationally distributed. I feel that both sides have valid points. Again, to me it is a matter of preference. It seems like only football cards issued from 1951 through 1988 have rookie cards that are pretty clear cut, with the exception of the 1955 Topps All-Americans & 1961 Topps/Fleer. You can't call something a rookie card 10 years after he retired (Hutson). Again, it's personal preference. The Contenders is numbered as part of the base set and is considered a true rookie card. I've never understood the allure of the SPA. Much like most of Rodgers' RC's, I dislike the red practice jerseys. I agree about the Bowman Chrome. Classic product, NFL uniform, great design. Wait a weak, the whim will pass. The Playoff Contenders is a true rookie card, not an insert/parallel. Here are Brady's true rookie cards I would recommend, after these three there is quite a bit of a drop off. bumping because I noticed a lot of Tom Brady rookie cards have doubled and even tripled in price since this thread started. Looks like they could go even higher the next few weeks. So the two best holy grails now for football seem to be Tom Brady and Joe Namath rookie cards. I am not sure I agree with this statement. Joe Namath RC, sure, but Brady? The big problem here is that Brady has quite a few rookies, such as the SP Authentic, Playoff Contenders, Bowman Chrome, etc. So which one is the holy grail here? Also, would you take a Brady RC over the 1935 National Chicle Bronko Nagurski? I sure as hell wouldn't! If he loses this time around, I'm positive the prices will cool down. The Eagles know that in order to beat a champion you have to knock him out because there is no way they will win by decision. I should have worded it better I should have said the holy grails of vintage and modern football cards. Namath the grail of vintage football cards. Brady the grails of modern football cards. Also I would in a heartbeat take Brady rookie cards over 1935 National Chicle Bronko Nagurski. Why? It is so much easier to flip and the Brady card has not peaked yet. We have to factor in modern collectors. I know of a few modern collectors who much rather have the 86 Jordan rc over the Mickey Mantle rookie for 52 Topps. I know it's hard to believe, but the modern collectors go by nostalgia just like the vintage collectors do. Jordan was their Mantle just like Brady is their Namath. Brady beat Russell Wilson and Peyton Manning in the Superbowl. This Philly team might be their easiest match yet with Brady going against a backup quarterback. Last edited by MRSPORTSCARDCOLLECTOR; 01-25-2018 at 05:57 PM. Brady never faced Peyton Manning in the Super Bowl. It's impossible - they both spent their whole careers in the AFC. He did beat Kurt Warner, Donovan McNabb, Jake Delhomme, Russell Wilson and Matt Ryan.... and lost to Eli Manning. and lost to Eli Manning. Not grails by any means, but I like them. Correct I was thinking of AFC Championship with Manning. The main point is the Tom Brady rookie cards will continue to go up significantly if the Patriots win the SB next week and win another next year. The Tom Brady rookie cards are the modern holy grails of football. One went for over 92k on Ebay about a week ago. That is amazing for a card that came out in 2000. Last edited by MRSPORTSCARDCOLLECTOR; 01-26-2018 at 03:49 PM. The Metal card is very easy to chip. So it can be somewhat almost as delicate as a vintage card. If only I had rolled my life savings into the 2000 Playoff Contenders Brady RC 10 years ago! The PSA 10’s look like they will breach $100k with a Super Bowl victory.